A brand new E4 primetime entertainment series is looking for members of the public to take part. During September and October this year, a luxury hotel in Greece will be managed by a group of Celebrities, with the aim of bringing a top-notch five star service to their guests. 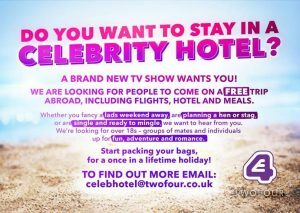 The casting team are now looking for individuals and groups of people to stay in the hotel. If you are celebrating, get in touch with the team to apply to take part. You will get free flights, free accommodation in the luxury Hotel and meals are also included.